"DEPARTURES & ARRIVALS IN THE NORTHERN FOREST!" Yes, today Hototo, Honaw & Honovi are leaving here with Rosaire & going to their new home. It has only been three months, however, I am already emotionally attached to them. As I have interacted with the puppies everyday since their birth a close attachment occurs. It is difficult to part with them! However, I still have the pleasure of playing & working on the development of Halona, Hurit, Hok'ee & Hinto. It is with thanks to Rosaire, with the loan of Tony, that I was able to produce this wonderful litter. On the Puppies Page there are a few new photos of the Pups taken after eating their breakfast. They are now 12 weeks old and have really grown. It is interesting to look back and see how quickly they have developed. On the "arrivals" side, tomorrow David arrives here and starts his stay at Miortuk. He will be initiated on Tuesday Morning to the first run of the season with the dogs. It should be a very exciting morning as the dogs are all ready,with the changing lower temperatures, to get running. 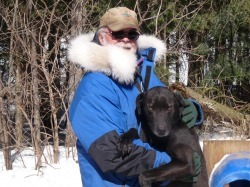 It should be a busy week here with David's arrival & the Fall conditioning starting for the dogs (& Musher) with the anticipation of a great racing season ahead.